On Sunday, July 5, Congressman Robert Aderholt visited the 4th Congressional District and attended a service at Crossroads Baptist Church in Hayden and an evening fireworks display to honor our nation’s birthday. The congressman addressed church members on the importance that the holiday holds for the nation as a whole. The congressman kicked off the evening’s festivities in Hayden where he met and enjoyed conversation with attendees prior to the celebration. 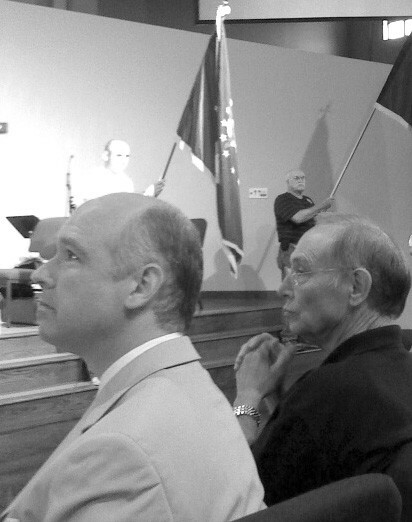 He then joined the audience in listening to the choir sing beloved patriotic tunes such as “This is America” and “Salute to the Armed Forces,” which honored all branches of the U.S. military. Following a video presentation, the congressman addressed the crowd, noting that his years of public service had afforded him the opportunity to meet with many citizens to discuss the characteristics that make this nation what it is today. He also spoke of his humbling experience as a member of the U.S. Congress because of the history that surrounds the sacred halls of the U.S. Capitol and the U.S. House of Representatives. Transitioning into an evening of firework celebrations, the Congressman met and spoke one-onone with citizens of Hayden, where he mingled with constituents amidst the fanfare. The fireworks display was the perfect end to the exciting evening of celebration, cookout and meet-and-greets with members of the 4th District.